Still waiting for race pictures so I can post my recap, but in the meantime, I have another picture to share. I was in a local arts & crafts store yesterday when I came upon something that made my jaw hit the floor. I guess, at the start of August, I could understand a few ornaments on display. But this was aisles upon aisles of ornaments, trees, decor, stockings, lights and wreaths. Plus, there were more rows left empty for even more holiday items. I am now feeling completely behind my game for 2013. I mean, I have to get through back to school, Labor Day, Halloween, our anniversary and Thanksgiving, and now my brain is all ChristmasChristmasChristmas! For about three seconds yesterday, I actually considered picking up a few wintery items, just in case. Of course, I saw reason immediately, but it got right in my head. Listen, I love holidays and I tend to go all out with festive menus and decorating the house, but this takes disrespecting the turkey to a whole new level. What do you think? Too soon for holiday decor shopping or just right? Are you ready for Christmas and the winter holidays? Do you really do it up for the holidays? 14 Responses to deck the halls? We have a radio station here and it plays Christmas music non stop from the week of Thanksgiving, through New Years and I listed to it religiously, Meaning, I LOVE Christmas. BUT, it has a time and place. I can see picking up decorations in the fall, but summer doesn’t technically end until September 21. And holy hell, that costs $999? WOW! I try and do it up inside my house as much as I can, using everything we have to decorate. BUT, we need to dress up the outside of the house, we have not bought any decorations that would fit with our new house yet. I said new, okay, we have been there 2 years. Amanda @ There Are 2 Sides recently posted…Home Improvement. Oh, we have the holiday station too, but it’s August!!!! 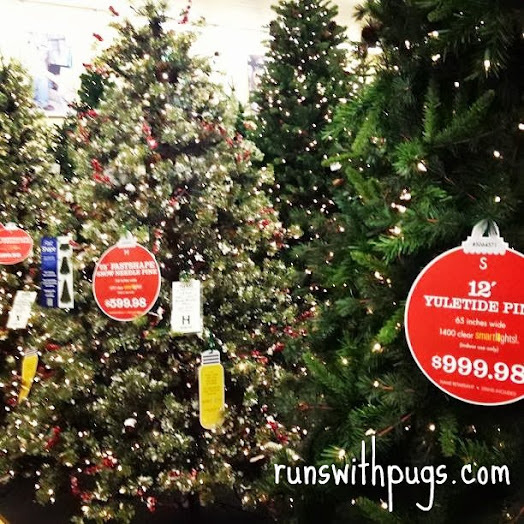 I didn’t even notice the price tag on that tree. It was pretty big, but I didn’t get a good look at it, so when my friend pointed out that it was a grand, I was even more shocked. LOL! We’ll be here seven years this November, and we STILL need more outside decorations. Think twinkle lights a la Clark Griswold. Oh, yeah. It’s August!! Usually they wait until almost Halloween before the stores are all decked out. That’s insane. $999 is also insane, but that’s a whole other post. Jeepers. I am not ready for Christmas! SOOO many fun/cool things before then! I wish I had gotten a good look at the thousand dollar tree. Some are really large and beautiful and I can see them being worth it, but we’re a real tree household, so the sticker shock is there. And you’re right, there are so many fun things before 12/25! I want to enjoy them all! I saw this kind of stuff in July, no kidding. It’s too early! Can’t we just enjoy the now? Personally, I don’t put the decorations out until the day after Thanksgiving and they go back the week of New Years. It’s just how I’ve always done it. Our tree doesn’t go up til after 12/1. Of course, we get a real tree, so it has to last through Christmas, but I definitely tend to decorate on the later side. I’m use to seeing Christmas stuff in September, but August, really far out that’s way to early. I don’t want to know. I don’t do Christmas, not my thing, and I have kids with birthdays pretty much right around that time, so it’s too much. But that’s just me. I wouldn’t have been stunned by September, but July and August is just crazy to me! Sounds like you have a busy December! Woah woah woah. It is WAY TOO EARLY for Christmas decorations to be out! I mean, I’ll put on a holiday hat for Christmas in July, but that’s it! I mean, the kids around here haven’t even gone back to school yet. And I am sooo not ready for the cold weather yet. We still have fall to enjoy! Well, I am ready for cooler weather, but it’s been brutal here. But, yes. The trees need to wait at least another month. You cracked me up when you said “disrespecting the turkey.” HaHa! I love the holidays, but I like keeping them in the proper order and not rushing to the next one too quickly! I’m with you… It’s just too early to be seeing Christmas stuff! It is way too early. I think when we do this stuff the season loses all the magic that having to wait for it and it lasting such a short time used to give it.